and congregation for over a thousand years. fascinating source of reference for the area. If the weather is reasonable, you may like to begin outside from the churchyard path. You are looking at a typical two cell Romanesque building, dated 1097 AD, probably on the site of an earlier Saxon wooden church, and remarkably unchanged in its ground plan. 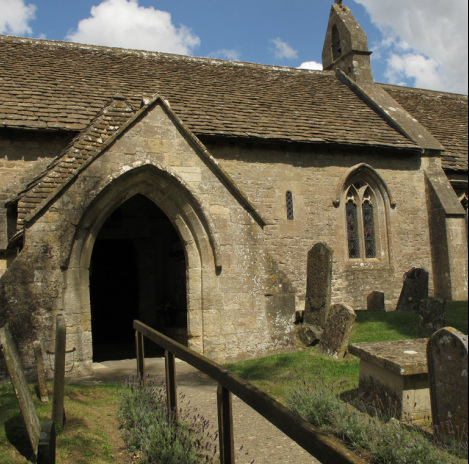 To visualise the early Norman church you must ignore the porch and the small priest’s door (added in C14th) and then imagine all of the windows to be high, narrow slits - like the only one remaining unchanged, which is to the east (right) of the main door. The next window along was enlarged in the C14th Decorated period. On its left hand jamb you can see the markings of a scratch dial (above right). 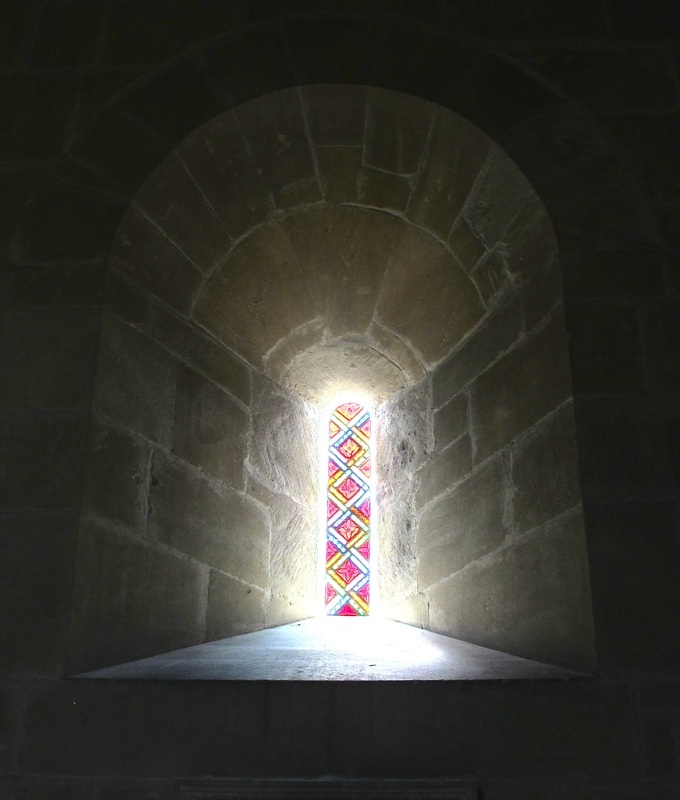 The square headed Perpendicular windows of the chancel are C15th insertions. The bell cot and its bell are mid C16th. Now go into the porch. Here you can see the Norman doorway with its acanthus leaf carving, arching around a recessed niche where traces of the original colouring can just be seen (above). 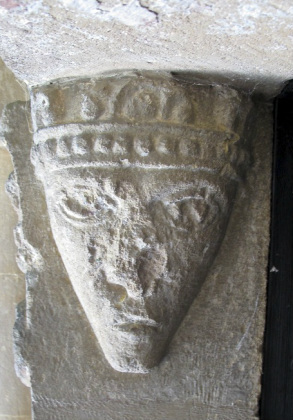 Two human heads face inwards, very rare in Norman buildings, (below top) and fine dragon-like beasts are carved on the outer face (below bottom). On your left, above the stone benches provided for coffin bearers, are two examples of some very early graffiti, one dated 1672. Enter the church and go to the back. If it is dark, you may turn on the lights - the switches are back left as you face the back of the Church. Behind you, in the corners of the west wall, you will see two roundels exposing the original plaster (right). The crosses were painted to mark where the bishop made that sign when the building was first dedicated. The west window, C15th perpendicular, proclaims Christ’s resurrection in confident Victorian glass (below left). Note the variation in spelling of the name Ditteridge on the list of Rectors and Patrons from 1304 (ditch and ridge refers to the Roman Fosse Way which borders the parish). Note also a stone tablet commemorating those who returned from the Great War. 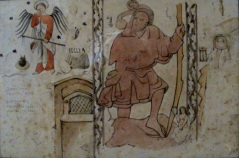 An older temporary wooden triptych (above right) can be seen in the vestry. The font (below left) may be older than the church itself. 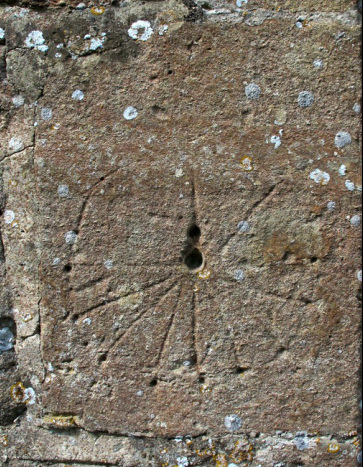 In its rough carving one can still see the marks of the mason’s compasses. The door facing the porch now leads to a modern vestry, added in the 1960s. It is in the position of the old north door which had been blocked up, and where a small window had been inserted. This was once the location of a huge wall painting of the traveller's Saint, Christopher, carefully recorded when it was uncovered in 1854. A water colour is on the wall (below centre). In order not to obscure the memorial tablets, the full size reproduction of the wall painting hangs to the left of its original location, where it would have been visible to passers-by. A small cartoon of it (below right) shows what the church has lost - Christopher and the Christ Child, the Angel of Doom weighing souls, and even a little mermaid (representing the false lure of fleshly temptation!) in the waves of the river. The mural inspired the design of the window beside the Godwin brass lectern (below left). Explanations of the recesses below this window can only be informed guesses - so we shall leave you guessing! The C14th window (below right) beside the pulpit shows Moses with the law, plus that well known saint A N Other - either the law and the prophets, or the Old and New Testaments. The intriguing stairway (below left) led to a rood loft, supporting a crucifix and from which the gospel was once read. The end of a beam (on the right of the photo on the left) and a stone bracket within the choir are all that remain of its bridge-like structure. The carved pulpit (below right) was erected in the 1850s when the church architect EW Godwin supervised much needed restoration work. It's carved decoration is taken from Ruskin’s Stones of Venice. The chancel arch (below left), originally round headed, was altered in Cl3th to accommodate the rood loft. The organ (below middle) was built in 1909, rebuilt in 1992, and encased in oak from a tree grown and seasoned in the parish in 2000 to mark the millennium. The floor tiles (below right) by Minton, Hollins and Co are from the same batch as those which grace Hereford Cathedral. Past clergy are buried beneath the choir, among them poor Hawes, with his family of six children, looking like a primitive Christian, which is not much the line of the clergy these days according to his bishop. The brass from his grave is now fixed to the wall within the choir. The church’s glass is mostly designed by Horwood and installed by Bell. The choir windows display the symbols of the twelve apostles and of the four evangelists. 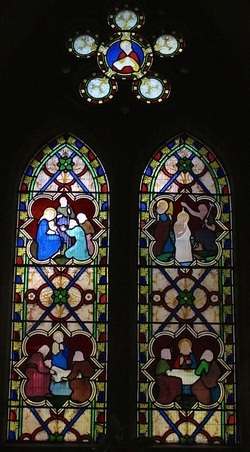 The East window depicts scenes from the life of Christ - his birth, his baptism, his body taken from the cross, and his appearance to his disciples at supper at Emmaus after the resurrection. Inside the altar rail (below left) and to the right is the piscina, the carved bowl for the washing of the cup and plate at communion (below right). This is C13th and the threefold shelf is the only one of its kind in the country. 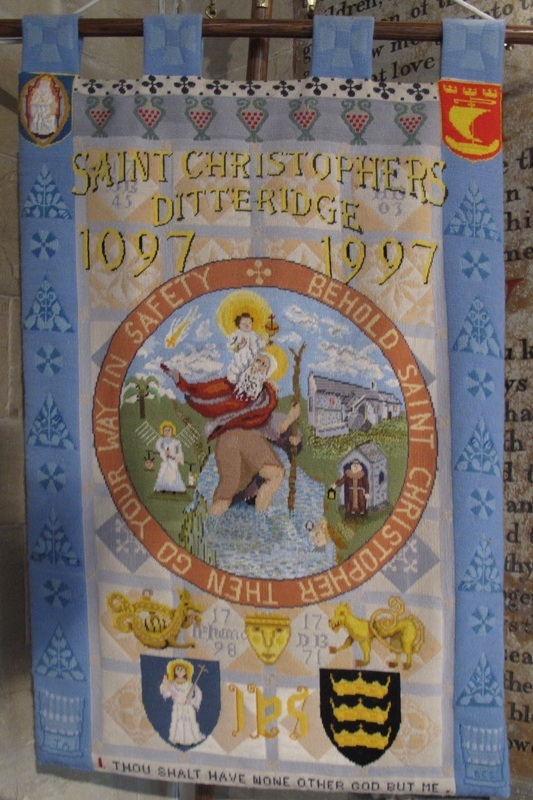 The St Christopher's banner, to the left of the altar, was embroidered by a member of the congregation who learned to do it while spending hours on a mine-sweeper (below left). The Commandments (below centre and right) still adorn the East wall either side of the Godwin altar, with its carved frieze echoing the dedication crosses which you saw when you first came into the church. St Margaret of Antioch, once swallowed by a dragon! Inside the church of the south wall are some attractive modern features including the glass in a slit window (below left) and, in a window niche, a bronze head of Christ (below right) with the inscription FG 74 11/11. Now look back. What you see is not a museum: it is a living, active house of prayer. So say a prayer before you leave; for yourself, your dearest, and of your charity, please pray for us who also worship God in this place. Oh, and as you go, please turn out the lights and shut the door! What a lot of dead people live here ! Photos courtesy Box Parish Council unless otherwise stated. Ditteridge is one of those villages known as a continuous settlement. Excavations in 1998 and 1999 confirmed that there were hunters, farms and farmers in Ditteridge long before recorded history. The Romans built a spreading villa where Cheyney Court now stands, and it was the Romans who indirectly gave it its name - from the fosse and camber (ditch and ridge) of the great Fosse Way. With the departure of the Romans Ditch-ridge was the centre of an extensive Saxon estate, once the lands of Thegn Aelfston de Buscombe. Part was leased at one time by the Benedictines of Bremhill for Malmesbury Abbey. Indeed the commissioners who came in 1086 compiling the Domesday Book had to settle its disputed ownership. There it is, for all to read, - land for one plough, villagers, cottagers, half a mill, meadow, pasture and woodland (there is no mention of Box in the Domesday Book) - all under the lordship of Robert, Count of Eu, and his son William. Little good did it do them. Twice implicated in treason, on the second occasion they suffered mutilation and their lands were forfeit to the crown. The present stone church was built in 1097, its vigorous Norman carved doorway evidence of the work of itinerant masons once employed in building in the Palace of Westminster. A few scraps of colour remain of the painted interior, with its fresco of Christopher, the wayfarer’s protector, and the angel of judgement weighing mortal souls in the divine scales. The church itself has its own history and well rewards a careful visit. In medieval times, the ownership of manors frequently changed hands. At one time Walter Croke, knight of the neighbouring parish of Hazelbury, seems to have held the manor. John Knoville (Nevil), friend of Reginald Croke, was Lord of the Manor of Ditteridge when he fell at Crecy in 1346. In 1348 the village was hard hit by the Black Death. Land lay uncultivated, the population greatly reduced in size, and the houses to the north of the church rotted away. Twenty years later, Joan, heir of Sir John Pavely of Westbury and ward of the Bishop of Winchester, was granted Ditteridge before marrying Ralph Cheyney, giving the manor court its name. Villagers came to rely more and more on the help and patronage of their Squire. Cheyney Court was later an international language school. With the dissolution of the monasteries and the Reformation came reorganisation of parish records. Around 25 boundary stones (B for Box, D for Ditteridge) still remain, looking like small mile stones. A map of 1630 shows that common fields were still being strip cultivated. The Iron hinges at the village pound for impounding stray cattle can be seen, and in the churchyard are buried casualties of the running battle fought from Bathford to Toghill via Bannerdown, and known as the Battle of Lansdown. Ditteridge was served by staunch Parliament men, though Cheyney Court remained loyal to the King. After the Restoration, (Charles II is reputed to have come on more than one occasion to Cheyney Court), Ditteridge was also a centre for Quakers. By the close of the 18th century Lady Anna Speke was in occupation of the Court, and her daughter Rachel at Hazelbury. Anna presented Ditteridge church with fine silver (now alas kept in the bank) and Rachel did the same for Box. 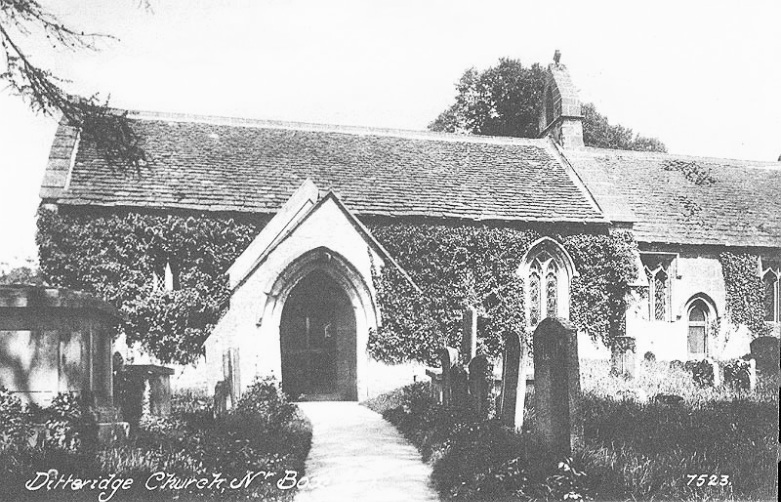 The ecclesiastical parish of Hazelbury was in decline and was amalgamated with Box. The Spekes gave place to the Northeys of Chippenham. 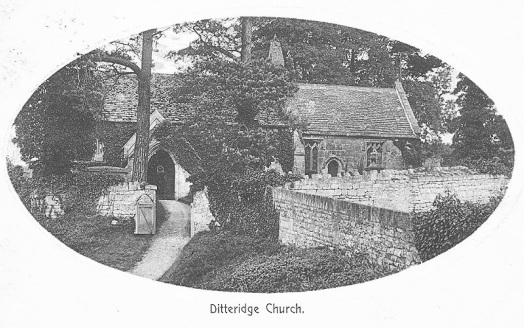 Early in the 19th century, Ditteridge had its own school, and a fine schoolroom and accommodation for a teacher was built from a converted barn. This in its turn became a vestry for the church, until a new vestry was built in 1966, and then it was rebuilt again as a Rectory. With the decline in the number of clergy the rectory was sold by the diocese in order to provide the finance for refurbishing Box vicarage. 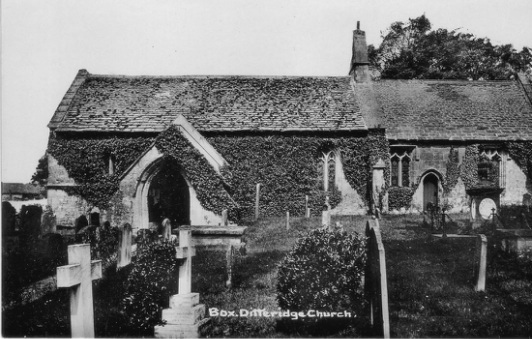 In 1884 the whole of the civil parish of Ditteridge was amalgamated with that of Box when the reorganised Chippenham Rural District also joined up with Calne. The two ecclesiastical parishes, Box with Hazelbury, and Ditteridge, each retain their own identity, each able to make its own distinctive contribution in common cause. So she was right. To the outside observer life in a sleepy hamlet may at first seem rather dead. But dead people live here!